Prices are per person per night and include bed and breakfast and on arrival a selection of homemade cakes. Smoking is not allowed inside the rooms. 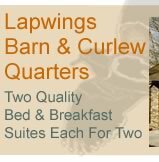 You may smoke on the balcony at Lapwings Barn and on the patio outside Curlew Quarters. A deposit of £15 per person (non-refundable) is requested on booking. Rooms are available from 3 pm although guests are welcome to arrive earlier by arrangement. Guests are requested to vacate the suite by 10.30 am. Weekend breaks may be available in the low season at special rates. We want to be helpful so please ask!